Few anglers can claim to have fished to hatches of this little olive mayfly, even though the species has been mentioned in popular angling entomologies like Caucci and Nastasi's Hatches or Knopp and Cormier's Mayflies. On many of the larger Eastern freestones, their emergence happens after the waters have warmed and dedicated anglers have turned their attention to streams that remain cold: headwaters, spring creeks, or tailwaters. Because good populations are usually not found in tiny streams, it is on some the Eastern tailwaters, like the branches of the Delaware, that fly fishers take notice of this species. Drunella cornutella looks like a Mini-Me version of Drunella cornuta. In streams where the two species cohabit, size is the only easy way to tell them apart. Although there is some slight overlap between the largest cornutella and the smallest cornuta, the average difference is usually pretty obvious. Both share very similar coloration and morphology (Morphology: The form and structure of an organism, or the study of the form and structure of organisms.) in all stages, even down to the little curved horns coming out of the frontal shelves of the nymph's heads. They usually follow cornuta by about 3-4 weeks, often when water temperatures approach their seasonal peak. Water Temperature: Emergence often commences as temperature approaches about 60-62 degrees. On freestone streams, emergence often happens in the hour or so after dawn. On tailwaters with cold (hypolimnetic) releases in the summer, emergence can sometimes shift to the evening. Like cornuta, the spinners are usually not very important. On larger, warmer freestones, the spinner fall is a dusk-into-dark affair, and fish may not feed until the water cools. On tailwaters, the spinners may compete with larger or more numerous species. Tibia: A middle segments in the leg of an insect, located between the femur and the tarsus.) length and other morphological niceties can be used to distinguish between cornutella and cornuta, but differences in size and emergence timing are more useful distinctions in the field. Range within a watershed also differs: cornutella tends to favor medium-to-large streams, and populations thin out in the headwaters; cornuta populations usually are found throughout the watershed, remaining strong into the headwaters. 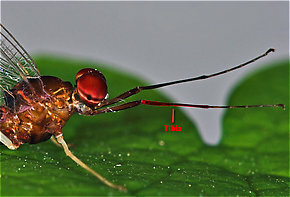 Larger "BWO" imitations used for Drunella cornuta need only be downsized, or "BWO" imitations used for Baetidae can upsized. Nymph imitations fish well during the period before or around emergence, even when opportunities to fish duns or spinners are slight. Morphology: The form and structure of an organism, or the study of the form and structure of organisms. Tibia: A middle segments in the leg of an insect, located between the femur and the tarsus.